Rooster Ridge grows organic fruit, flowers, herbs and vegetables for sale to local residents through farmer's markets, restaurants, groceries and florists. Nancy and Curt bought the property in 1997, built their home and started the farm in 1999. From the beginning, they wanted to focus on mostly perennial plants, for sustainability and in order to be able to do the work themselves, without outside labor. The farm received organic certification through CCOF in 2009. 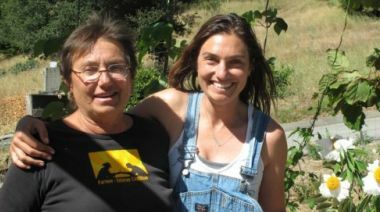 Nancy and Curt's daughter Haley Wall graduated from UCSC with a degree in Environmental Studies and joined the farm afterwards. Haley is the floral designer and flower specialist. Their sons Noah and Sam also help when needed. Rooster Ridge Farm is certified organic and dedicated to integrated pest management practices. Rooster Ridge soil is loamy sand, with tons of organic compost added throughout the years. Rooster Ridge uses only drip irrigation or dry farm when possible. Rooster Ridge also cures organic table olives from the farm, using time-honored cold during techniques. No lye or chemicals, just sea salt brine and herbs and spices.